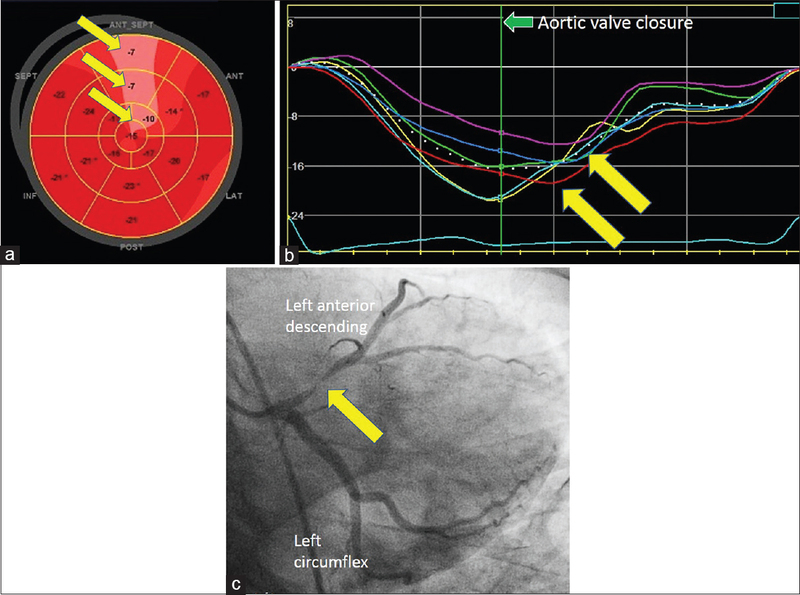 Background: Longitudinal strain analysis has been shown to be useful in patients with acute coronary syndromes and in stress echocardiography. The objective of this study is to identify the incremental diagnostic value of longitudinal strain analysis at rest, when added to routine treadmill testing (TMT), in identifying the presence of coronary artery disease in patients presenting with chronic stable angina (CSA). Methodology: We conducted a prospective study in which adult patients presenting with CSA and normal systolic function were enrolled. All patients were examined by 2-D echocardiography, longitudinal strain analysis, TMT, and either conventional coronary angiography and/ or coronary computed tomography angiography. Results: We enrolled a total of 150 subjects (54±7.8 years, 63% male). The sensitivity and specificity of TMT was 60.2% and 65.5% respectively. In comparison, global longitudinal strain (GLS) alone had better sensitivity (72.7%) and specificity (74.2%). Post-systolic shortening (PSS) had similar sensitivity for early detection of significant CAD. The combination of TMT and GLS provided the best overall diagnostic accuracy with a sensitivity of 85.4% and specificity of 87.5%, respectively. 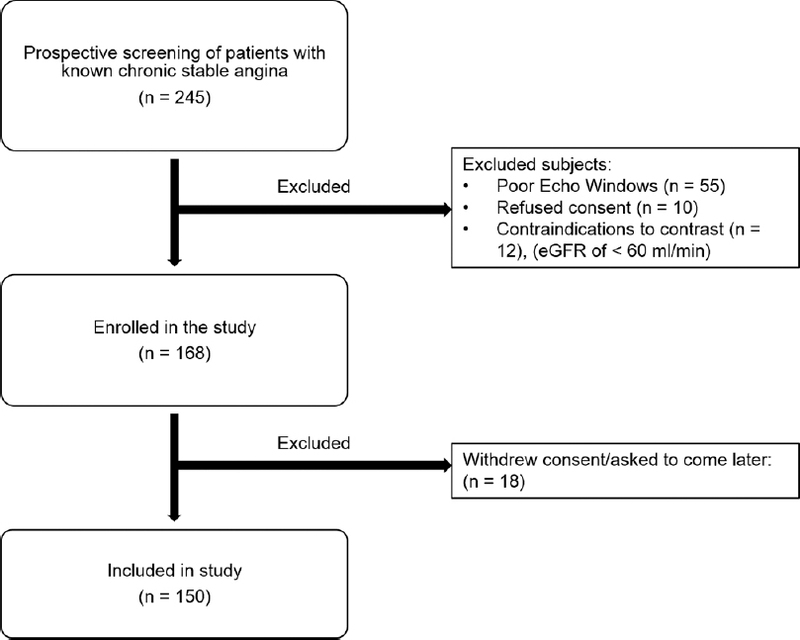 The optimal cut off for GLS for identification of coronary artery disease was −17.75%. Conclusions: In patients presenting with chronic stable angina and normal systolic function, global longitudinal strain and post systolic shortening assessed at rest have excellent diagnostic accuracy for coronary artery disease. Longitudinal strain analysis is superior to conventional TMT and adds to its diagnostic performance. Chronic stable angina (CSA) is a common initial manifestation of coronary artery disease (CAD), occurring in approximately 50% of cardiovascular disease patients, and causing a significant burden at the primary, secondary, and tertiary healthcare levels., Accurate diagnosis of chest pain due to CAD is important for the initiation of interventions to reduce the future risk of a more serious cardiac event. Noninvasive stress testing is preferred for most patients presenting with CSA. Treadmill testing (TMT) is a good initial choice in patients who can exercise and who have normal electrocardiographic findings at rest. However, the sensitivity and specificity of TMT is limited, especially in women, and it is not suitable for all patients. Imaging tests, such as exercise or pharmacologic stress echocardiography, computed tomography coronary angiography (CTCA), myocardial perfusion imaging, or adenosine stress perfusion magnetic resonance imaging, provide incremental diagnostic value and improved accuracy, but at additional expense. In addition, they may not be available at all centers. Longitudinal strain analysis using two-dimensional speckle-tracking echocardiography (2D-STE) has been shown to be useful in patients with acute coronary syndromes and in stress echocardiography. Whereas global longitudinal strain (GLS), like ejection fraction, is nonspecific for CAD and is also reduced in many cardiac disorders, postsystolic shortening (PSS) 8211; a strain-based measure of the timing of myocardial deformation - is more specific for ischemia. However, the utility of these parameters in the Indian population, where the burden of CAD is high, has not been prospectively evaluated. 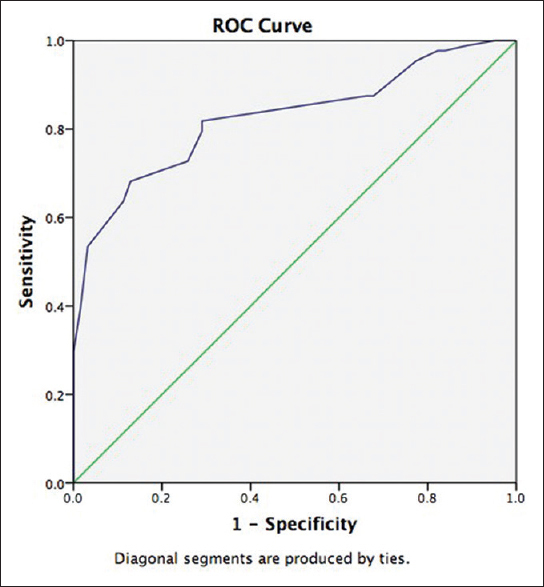 The objective of this study is to identify the incremental diagnostic value of longitudinal strain analysis at rest, when added to routine TMT, in identifying the presence of hemodynamically significant CAD in patients presenting with chronic stable angina. We conducted a prospective observational study at a single-tertiary referral center from January 2016 to February 2017. Adult participants were included if they had chronic stable angina, no documented CAD, and normal left ventricle systolic function. Anginal symptoms were considered stable if they had been occurring for several weeks without deterioration and were typically induced by activity or stress. Participants were excluded if they had clinical instability, heart failure, valvular heart disease of moderate or greater in severity, had uninterpretable electrocardiography, or were unable to exercise on a treadmill to target heart rate. Written informed consent was obtained from all patients at the time of enrollment. The study was approved by the hospital's Ethics Committee before its initiation. Reporting of study methods and results follows the revised Standards for Reporting of Diagnostic Accuracy guidelines. All patients were examined by 2D echocardiography, 2D-STE for GLS, and PSS, exercise TMT, and either computed tomography coronary angiography (CTCA) or CAG. Due to the high prevalence of CAD in patients undergoing invasive CAG at our center (80%8211;90%), participants who were scheduled for CTCA were also included in our study. This was done to avoid biasing the study by enrolling only a CAG population which would have a very high prevalence of disease. All participants with an abnormal CTCA suggestive of significant CAD (>50% stenosis of an epicardial coronary artery >2-mm diameter) underwent CAG. All patients underwent symptom-limited TMT per standard Bruce protocol. TMT was interpreted as either normal or abnormal by two blinded investigators. An abnormal exercise ST response was defined as ≥1 mm of horizontal or downsloping ST depression (J point + 80 ms) or ≥1 mm ST-segment elevation. Duke treadmill score (DTS) was calculated for all patients. Transthoracic echocardiographic studies were acquired following the guidelines of the Indian Academy of Echocardiography. Images were acquired on an echo machine (Vivid E9 XD clear with version BT13 software, GE Vingmed, Horten, Norway) equipped with an adult 2.5 MHz transducer. Images were acquired from the parasternal long axis, parasternal short axis (basal, mid, and apical levels) and apical 4-, 3-, and 2-chamber views. For apical windows, care was taken to adjust the sector width to include the entire LV cavity and epicardial contours. Frame rate was kept between 56-92 frames per se cond. Tissue harmonic imaging was kept on. Depth, focus and gain settings were optimized for image quality. Contrast agents were not used as this interferes with the ability to interpret strain images. Two observers (SS 13 years' experience, RB 3 years' experience), who were blinded to clinical details, visually analyzed the echo images offline using dedicated software (EchoPACS, GE Vingmed, Horten, Norway). Using a 16-segment model, the endocardial and epicardial borders of the left ventricle (excluding papillary muscles) from the apical 4-, 3-, and 2-chamber views were semi-automatically traced at end-diastole and end-systole. End-diastole was defined at peak R-wave of the electrocardiogram and end-systole was defined at the timing of aortic valve closure (AVC). In case of disagreement by the observer with automatically defined borders, manual correction was applied. Region of interest thickness was kept the same for each study. PSS was identified visually on the segmental strain curves as myocardial shortening that occurred after end-diastole (after AVC). CTCA was performed on a 128-slice multidetector CT scanner (GE Discovery 750 HD, GE Healthcare, Milwaukee, USA). Images were reviewed by a blinded observer (SS, 13 years' experience) on a dedicated CT workstation with advanced cardiac analysis software (GE AW version 4.6) Scans were acquired, postprocessed, and reported in accordance with guidelines of the Society for Cardiovascular Computed Tomography. Within 7 days after TMT, participants underwent invasive CAG using standard techniques by experienced operators (VRI, PKD). Diameters of reference and stenotic coronary arteries were measured by a computer-assisted quantitative method (QuantCor Coronary Analysis, Siemens Medical Solutions, Erlangen, Germany). Data were analyzed using IBM SPSS Statistics, Version 22 (IBM Corporation, Armonk, New York, USA). Descriptive data were presented in the form of frequency, percentage for categorical variables and in the form of mean, median, standard deviation, and quartiles for continuous variables. Based on whether data followed the normal distribution, parametric or nonparametric test were used. Comparisons of the categorical variables between the study groups were performed using the Chi-square test and Fisher's test. Comparison of the continuous variables between two groups was performed using Mann8211;Whitney U-test and independent sample t-test. Simple and multiple linear regressions were used to develop a model to predict GLS score using variables considered in the present study. Simple and multiple logistic regressions were used to identify the risk of CAD using variables considered in the present study. Comparison of continuous study parameters between more than two groups were performed using ANOVA with turkey post hoc test and Friedman test with Wilcoxon signed-rank test. Diagnostic accuracy of TMT, GLS, and PSS in comparison to CAG (or CTCA) were calculated. P < 0.05 was considered as statistically significant. We enrolled a total of 150 participants [54 ± 7.8 years, 63% male, [Figure 1]. CAD was present in 88 of 150 participants (58%). Participants with CAD were older (56.2 ± 8.23 vs. 52.3 ± 7 years, P = 0.002) and had increased incidence of CAD risk factors including diabetes mellitus, hypertension, increased body mass index, and a family history of CAD compared to subjects without CAD (P < 0.05 for all). [Table 1] describes the baseline demographic characteristics of the study population. We evaluated a total of 2400 myocardial segments, of which 55 (2.3%) were excluded due to suboptimal image quality, leaving a total of 2345 segments included in the final analysis. There was no significant difference in echo parameters of global function left ventricular ejection fraction (LVEF), LV size, or diastolic function in the study population between those with and without CAD [Table 2]. However, GLS was reduced (less negative) in participants with CAD than those without CAD [−18.3% ± 2.4% vs. 15.1% ± 2.5%, P < 0.001;]. 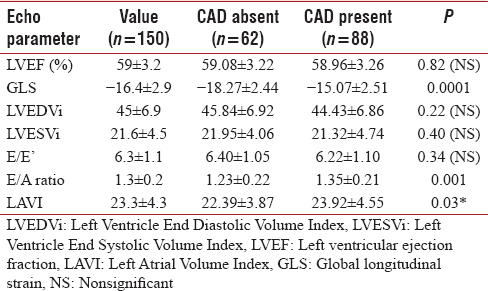 In addition, GLS values were lower (less negative) as the severity of CAD increased, as measured by the number of vessels with significant CAD on invasive CAG [Figure 2]. PSS was present in 97% of participants in the CAD group [Figure 3], and in 26.3% of the non-CAD group. The sensitivity and specificity of TMT was 60.2% and 65.5%, respectively, compared with CAG as the reference standard [Table 3]. In comparison, GLS alone had better sensitivity (72.7%) and specificity (74.2%), as did PSS (sensitivity 89.8%, specificity 72.6%). The combination of TMT and GLS provided the best overall diagnostic accuracy (sensitivity 85.4%, specificity 87.5%, positive predictive value 80%, and negative predictive value 83.3%). Participants in the CAD present group had a lower workload achieved compared with the CAD absent group (5.4 ± 0.7 vs. 9.2 ± 0.7 metabolic equivalents of task, P < 0.001). DTS was −12.4 ± 2.5 in the CAD present group vs. 0 in the CAD absent group. 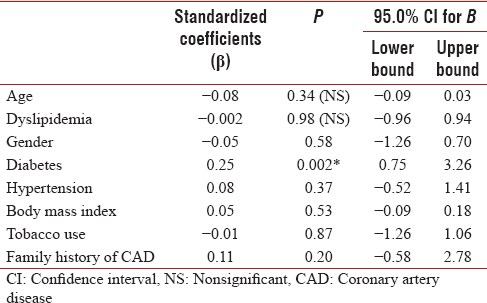 Receiver operating characteristic curve analysis showed the optimal cutoff for identification of CAD for GLS was −17.75% (sensitivity 82%, specificity 71%, 95% confidence interval [CI] 0.768211;0.89, area under curve [AUC] = 0.83, P < 0.001) [Figure 4]. We found that, in patients presenting with chronic stable angina and normal systolic function, GLS and PSS assessed by 2D-STE at rest have excellent diagnostic accuracy for CAD, using CAG as the reference standard. In comparison to TMT, GLS, and PSS have better diagnostic accuracy for detecting CAD. The combination of TMT plus GLS provided the best overall diagnostic accuracy (86.3% for TMT + GLS vs. 63% for TMT alone), approaching the diagnostic accuracy of several other noninvasive imaging modalities (stress echo, nuclear imaging, etc. ), albeit at a much lower cost. The results of our study suggest that, in patients with chronic stable angina undergoing TMT, longitudinal strain analysis for GLS and PSS by 2D-STE at rest should be added to improve the overall accuracy of the diagnostic approach. This is the first study in an Indian population to assess the diagnostic utility of longitudinal strain in the detection of CAD in chronic stable angina. The optimal cutoff for GLS in identifying CAD in our study was −17.75% (95% CI 0.768211;0.89, AUC = 0.83, P < 0.001). 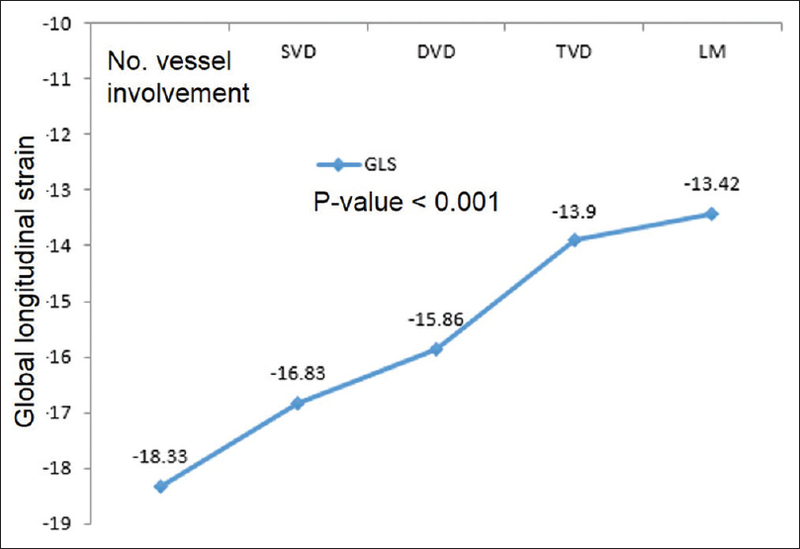 In addition, we found that GLS values reduce with increasing severity of CAD. This confirms the findings of previous studies of longitudinal strain in patients with CSA, although the optimal diagnostic cutoff for abnormal GLS in varies from study to study. For example, in a meta-analysis of 10 studies with 1385 patients, Liou et al. found that the accuracy of GLS for moderate-to-severe CAD had a pooled sensitivity, specificity, positive likelihood ratio, and negative likelihood ratio of 74.4%, 72.1%, 2.9, and 0.35, respectively. The optimal cutoff value of GLS was-15.6% (AUC 0.88, 95% CI - 0.788211;0.96, P < 0.001). Similarly, Shimoni et al. studied 97 participants with suspected CAD referred for CAG and found that GLS <−19.7% predicted significant CAD, defined as >50% diameter stenosis on CAG, with sensitivity 81% and specificity 67%. The differences in optimal cutoff value for GLS among various studies is likely due to intervendor variability in strain quantification, variations in study populations and study design (including definitions for significant CAD on CAG or CTCA), and operator skills. Our study highlights the need to improve the current diagnostic approach of TMT as the test of choice for patients with chronic stable angina who can exercise and have an interpretable ECG. TMT is widely available, inexpensive, easily interpretable, has prognostic significance, and is recommended as a first-line diagnostic test in patients with suspected CSA. However, the diagnostic accuracy of TMT in our study was modest at best, with sensitivity and specificity of 60% and 66%, respectively8211; similar to many previous studies across varying populations. Furthermore, in the group of participants with a negative TMT and an abnormal GLS, significant CAD was present on CAG in 29 out of 41 participants (71%). Although the best diagnostic accuracy was seen with the combination of TMT and GLS, GLS by itself had reasonable accuracy (sensitivity 72.7%, specificity 74.2%, positive predictive value 80%, negative predictive value 65.7%, and accuracy of 73.3%). This suggests that, in some clinical situations, GLS could be used alone when TMT is not possible or contraindicated8211; with the caveat that these findings apply only to subjects with CSA and normal LV systolic function. GLS, like LVEF, is nonspecific and can be reduced in many conditions, including diabetes, as reflected by our data. PSS is defined as myocardial shortening that occurs after end-systole (or AVC) and is measurable by 2D-STE or older tissue Doppler imaging techniques. PSS is observed mainly during isovolumic relaxation and is an accurate sign of deteriorating regional contractility. In experimental and clinical studies, it has been reported that the assessment of PSS is superior to that of conventional parameters such as wall thickening or peak systolic strain in diagnosing CAD. Studies have revealed that PSS is sometimes observed without a relative decrease of strain in the ischemic region, especially after recovery from ischemia. In our study, we found that PSS alone had high-diagnostic accuracy for the detection of CAD (sensitivity 89.8%, specificity 72.6%, and accuracy 82.7%). While this suggests that PSS may be useful for identification of CAD in patients presenting with CSA, there are several limitations to the technique that needs to be considered. First, there are several different means of quantifying PSS, including postsystolic index ([peak postsystolic strain] − [end-systolic strain])/(peak strain or maximum strain change during the cardiac cycle), time taken from AVC to peak postsystolic strain, and the presence of a biphasic shortening after systole. No standardized convention exists for quantification of PSS. Second, although PSS is thought to be specific for ischemia, it can occasionally be seen in segments with myocardial scar. Third, abnormal or cutoff values of the postsystolic index in each myocardial segment are still unclear, especially by STE, and this needs to be determined for use in clinical settings. Finally, the identification of PSS requires a slightly higher level of clinical experience compared to measuring GLS, which on contemporary echo machines is straightforward due to high-quality semi-automated quantification tools. Our study has several limitations which must be noted. First, this was a single-center study with a moderate sample size (n = 150). Second, these findings are applicable only to patients with normal systolic function at rest. Third, the diagnostic accuracy of strain analysis depends on image quality, which excluded a number of participants from enrollment in the study. Finally, either CAG using QCA or CTCA was used as the reference standard, rather than invasive fractional flow reserve on CAG. As discussed earlier, the use of CTCA as a “rule out” test for significant CAD was necessary due to the high prevalence of positive CAG studies at most high volume cath laboratories in India, to avoid skewing the study population. In patients presenting with chronic stable angina and normal systolic function, GLS and PSS assessed by 2D-STE at rest have excellent diagnostic accuracy for CAD. In patients with chronic stable angina undergoing TMT, longitudinal strain analysis for GLS and PSS by 2D-STE at rest should be added as an adjunctive tool to improve overall accuracy of the diagnostic approach. Whereas TMT alone has modest accuracy for the diagnosis of CAD, additional research is required to validate whether longitudinal strain analysis alone is sufficient to diagnose ischemia in patients with chronic stable angina. Hemingway H, McCallum A, Shipley M, Manderbacka K, Martikainen P, Keskimäki I, et al. Incidence and prognostic implications of stable angina pectoris among women and men. JAMA 2006;295:1404-11. Kannel WB, Feinleib M. Natural history of angina pectoris in the Framingham study. Prognosis and survival. Am J Cardiol 1972;29:154-63. Fihn SD, Blankenship JC, Alexander KP, Bittl JA, Byrne JG, Fletcher BJ, et al. 2014 ACC/AHA/AATS/PCNA/SCAI/STS focused update of the guideline for the diagnosis and management of patients with stable ischemic heart disease: A report of the American College of Cardiology/American Heart Association task force on practice guidelines, and the American Association for Thoracic Surgery, Preventive Cardiovascular Nurses Association, society for cardiovascular angiography and interventions, and Society of Thoracic Surgeons. Circulation 2014;130:1749-67. Bossuyt PM, Reitsma JB, Bruns DE, Gatsonis CA, Glasziou PP, Irwig L, et al. STARD 2015: An updated list of essential items for reporting diagnostic accuracy studies. BMJ 2015;351:h5527. Burkule N, Bansal M, Mehrotra R, Venkateshvaran A. IAE performance standards and recommendations for a comprehensive transthoracic echocardiographic study in adults. J Indian Acad Echocardiogr Cardiovasc Imaging 2017;1:1-17. Leipsic J, Abbara S, Achenbach S, Cury R, Earls JP, Mancini GJ, et al. SCCT guidelines for the interpretation and reporting of coronary CT angiography: A report of the society of cardiovascular computed tomography guidelines committee. J Cardiovasc Comput Tomogr 2014;8:342-58. Liou K, Negishi K, Ho S, Russell EA, Cranney G, Ooi SY, et al. Detection of obstructive coronary artery disease using peak systolic global longitudinal strain derived by two-dimensional speckle-tracking: A Systematic review and meta-analysis. J Am Soc Echocardiogr 2016;29:724-35. Shimoni S, Gendelman G, Ayzenberg O, Smirin N, Lysyansky P, Edri O, et al. Differential effects of coronary artery stenosis on myocardial function: The value of myocardial strain analysis for the detection of coronary artery disease. J Am Soc Echocardiogr 2011;24:748-57. Voigt JU, Pedrizzetti G, Lysyansky P, Marwick TH, Houle H, Baumann R, et al. Definitions for a common standard for 2D speckle tracking echocardiography: Consensus document of the EACVI/ASE/Industry task force to standardize deformation imaging. Eur Heart J Cardiovasc Imaging 2015;16:1-11. Qaseem A, Fihn SD, Williams S, Dallas P, Owens DK, Shekelle P, et al. Diagnosis of stable ischemic heart disease: Summary of a clinical practice guideline from the American College of Physicians/American College of Cardiology Foundation/American Heart Association/American Association for Thoracic Surgery/Preventive Cardiovascular Nurses Association/Society of Thoracic Surgeons. Ann Intern Med 2012;157:729-34. Schlant RC, Friesinger GC 2nd, Leonard JJ. Clinical competence in exercise testing. A statement for physicians from the ACP/ACC/AHA task force on clinical privileges in cardiology. J Am Coll Cardiol 1990;16:1061-5. Asanuma T, Nakatani S. Myocardial ischaemia and post-systolic shortening. Heart 2015;101:509-16. Asanuma T, Uranishi A, Masuda K, Ishikura F, Beppu S, Nakatani S, et al. Assessment of myocardial ischemic memory using persistence of post-systolic thickening after recovery from ischemia. JACC Cardiovasc Imaging 2009;2:1253-61.